Not every Dad loves a nappy bag. I assume it’s because most nappy bags in the bag market are aimed at women and look like .. well, a woman’s bag, which makes it tricky for a Dad – even more so if you’re not usually the bag-wearing kind. So before you say “I don’t need a bag”, save yourself the heartache of trying to stuff packets of wipes, nappies and various other paraphernalia into your cargo pants and take a look at this little gem. There’s no denying the bags from Melbourne’s own All The King’s Men are uber cool. 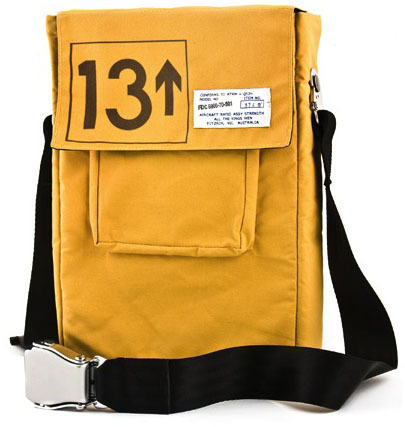 These Runway Models are part of a limited run made from the same durable yellow canvas but individually numbered so there’s no fear someone will be carrying exactly the same bag as you! Technically it’s a laptop bag but hey, imagination is the limit here. Perfectly sized at 35 x 25 centimetres, it’s big enough to carry what you need without any fuss whatsoever. You may or may not have noticed that the shoulder strap for this bag is actually an aeroplane seat belt. Seriously, how cool is that? Of course when you’re off Dad duty, the Runway Model bag can go back to the life it was born to lead, that of a laptop bag! The Runway Model bag has a recommended retail price of $220 but if you’re quick, you can buy yours for $199.95 at Rushfaster. Delivery is available all over Australia for a flat rate of $9.95.